Penguins rookie winger Jayson Megna was forced to wear a Halloween pumpkin t-shirt during the team’s recent road trip because he lost a shootout back in Pittsburgh. But after Monday night’s game in Carolina, he may opt to keep wearing the shirt in the future. Megna, whose parents were in attendance, recorded his first career NHL goal and assist for a two-point night as the Penguins snapped a three-game losing streak with a 3-1 victory against the Hurricanes at PNC Arena. Megna’s first career goal was set up by none other than Sidney Crosby. Megan was crashing the net when Crosby’s shot went off of Megna’s shin guard and into the goal. “Not how I dreamed it up, but I’ll take them anyway I can get them,” Megna joked. As for keeping the Halloween shirt? 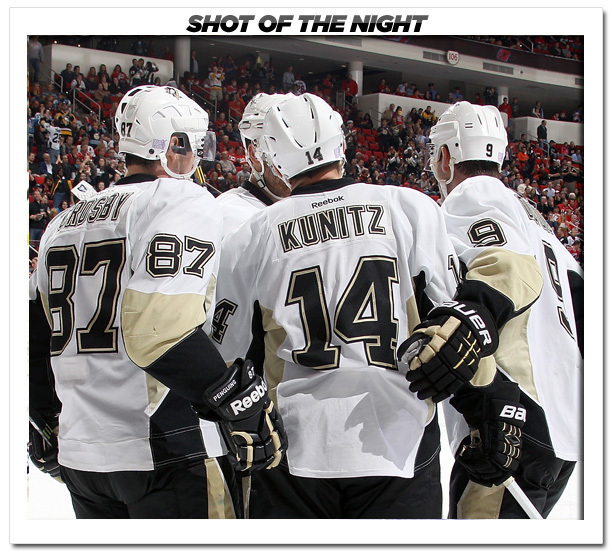 The Penguins also had goals from Chris Kunitz and Tanner Glass. Marc-Andre Fleury made 20 saves. Nathan Gerbe was the lone goal scorer for Carolina. The Penguins’ opening goal was the result of a well-executed faceoff play in the neutral zone. The Penguins have used this play a lot. Paul Martin lined up as a forward and Megna lined up as the defenseman for a draw just outside the Carolina blue line. As the puck dropped Megna sprinted forward. Crosby won the puck back to defenseman Brooks Orpik on the point. Orpik threw a bank pass off the boards to a speeding Megna, who easily blew past the Hurricanes defenders to retrieve the rubber. Megna threw a shot on goal that Justin Peters kicked out. Tanner Glass, driving to the net on the opposite side, was at the right spot to find the rebound and smack it into the goal. A lot of players stepped up for the Penguins in tonight’s win. But one player who was monumental in the outcome, but didn’t appear on the scoresheet was defenseman Paul Martin. It was a brilliant play by Martin in the defensive zone that led to the Penguins second goal. The Hurricanes had an extended zone-time shift and Martin had the puck in the far corner. Instead of taking the easy dump out, he skated around his own goal and zipped a pass to Brooks Orpik. Orpik then sent a breakout pass to Crosby, who spun at the blue line and found Chris Kunitz for a one-timer goal. But it was Martin’s smarts that led to the score. Late in the third period the Hurricanes sent a shot on goal that Fleury stopped. The rebound, however, bounced in the blue paint with Fleury helpless. Alexander Semin was going for the puck. Martin stick-checked him and then cleared the rubber out of danger. Defenseman Rob Scuderi suffered a broken ankle in Saturday’s game in Toronto, head coach Dan Bylsma announced after the game. Forward Chuck Kobasew suffered a lower-body injury midway through the first period after skating just 2:33 minutes. He will be re-evaluated in Pittsburgh. *Crosby continues to build on his NHL lead in points. He added two more tonight with a pair of assists. He now has 20 points (8G-12A) on the season. Crosby also won the faceoff that led to the Penguins’ first goal, though did not get an assist. So the captain factored in on all three goals. *Defenseman Brooks Orpik had a career night with three assists. His three helpers tied a career high, previously set March 28, 2010 vs. Toronto.